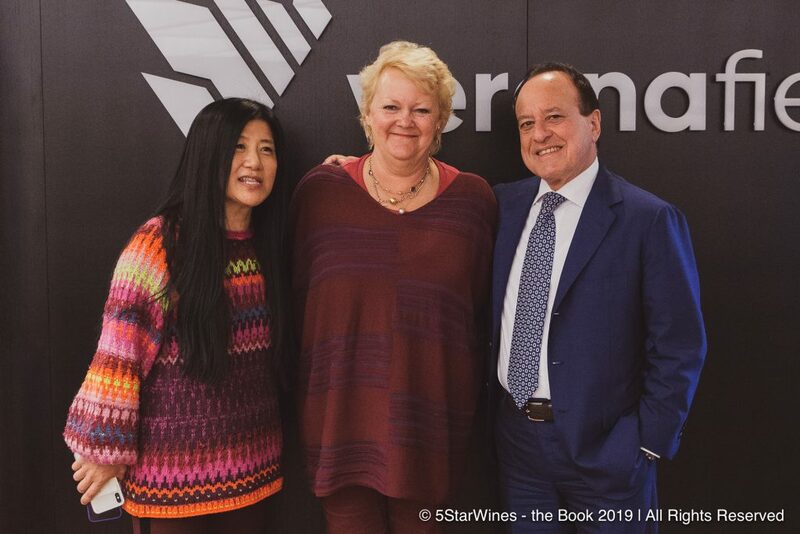 Lynne Sherriff MW and Daniele Cernilli will lead the cohort of 80+ judges for 5StarWines 2019, the international wine selection that will take place in Verona, Italy, from the 3rd to the 5th of April 2019. Sherriff and Cernilli—respectively former Chairman of the Institute of Masters of Wine and one of the founders of iconic Italian food and wine guide Gambero Rosso—will lend their decades-long expertise to evaluate wines coming from all over the world. 5StarWines is the annual selection of wines organized by Veronafiere and Vinitaly and held in Veronafiere’s exhibition center in the lead up to Vinitaly, the largest Italian wine fair in the world. At its third edition, this three-day blind tasting will select wines for the new edition of the wine guide 5StarWines – the Book. The guide puts a spotlight on the continuous efforts made by wineries that invest in the improvement of their products and are interested in gaining international visibility. A significant part of 5StarWines – the Book lies with the international panel of judges made up of highly qualified international experts, sommeliers, and influential wine journalists with a wide array of qualifications such as Master of Wine (MW) and Master of Sommelier (MS). In 2019 the 5StarWines grand tasting will be chaired by Senior General Chairman Lynne Sherriff MW. Originally from South Africa, Sherriff became an MW in 1993 and was chairman of the Institute of Masters of Wine from 2010 to 2012. She was nominated as one of the 50 most influential people in the world of wine by Wine Intelligence UK. She currently works as an educator and independent wine consultant, specializing in production, blending, and marketing, with a focus on Europe, Africa, and Asia. Sherriff is not the only important addition to the panel of judges. For the first time since its inception, 5StarWines 2019 will include an Italian General Chairman, the internationally-renowned wine critic Daniele Cernilli. Cernilli was one of the founders of food and wine media outlet Gambero Rosso and the editor of Gambero Rosso’s Guida dei Vini d’Italia for 24 years. During his long career, he has tasted, evaluated, and classified roughly 150,000 wines. He also invented the famous “Tre Bicchieri” classification system. Most recently, he has created the web magazine DoctorWine that has rapidly become one of the most prominent magazines of the wine world. Both Sherriff and Cernilli’s reputation, expertise, and guidance will ensure that 5StarWines will be a momentous event once again, an international tasting where the quality of well-established wines will be restated and the value of lesser-known brands discovered and acknowledged. Other international wine judges that have been confirmed as General Chairmen for the 2019 edition are: Robert Joseph (Editor-at-large at Meininger’s Wine Business International and founder of the International Wine Challenge, one of the most influential wine selections in the UK); Pedro Ballesteros Torres MW (Master of Wine and Vinitaly International Academy’s Italian Wine Ambassador); Bernard Burtschy (wine columnist at Le Figaro). Finally, Monty Waldin (biodynamic wine writer, journalist at Decanter, and Italian Wine Podcast host) has been confirmed as the Panel Chairman for Wine Without Walls, the selection of 5StarWines dedicated to biodynamic and organic wines. Our panel of judges is predominantly international because we want Italian wine producers to sell their wines abroad. We want to appeal to an international palate, so this goal only becomes achievable when our wines are tasted by international experts. I am looking forward to working with Lynne Sherriff MW, whose international stand and immense expertise in assessing wines is well-known. In addition, we also felt it was time for 5StarWines to embrace an Italian General Chairman. For this reason, we are grateful to Italian wine critic Daniele Cernilli for accepting this challenge. We are also incredibly grateful for the returning General Chairmen Pedro Ballesteros Torres MW, Bernard Burtschy, Robert Joseph, and Monty Waldin which will assure the continuity from the previous editions. The 5StarWines 2019 online registration is now open for all wineries and features early-bird fees, with a 15% discount. It is therefore a timely opportunity for producers to enroll at reduced price in order to have their wines evaluated by top judges from around the world.